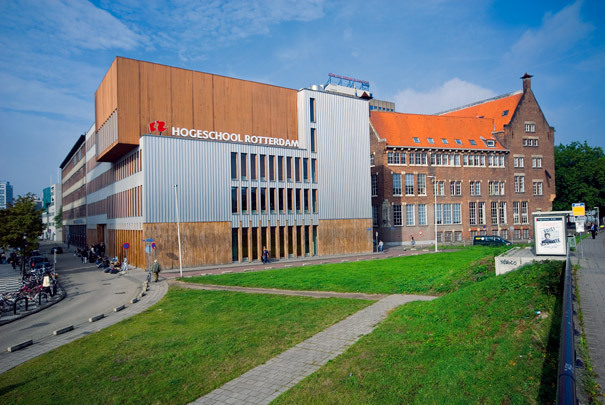 The new extension to the Rotterdam Academy of Visual Arts is situated on Wijnhaven. This was using a former bank office by architect Kropholler on the Blaak since 1982. Between 1930 and 1934 existing premises on Blaak (in those days Zuidblaak) were converted into an office building for the firm of R. Mees & Zoonen, who had been domiciled here since 1745. Its new brick facade had sandstone corbels and lintels whose irregular disposition was informed by the surrounding buildings. The public and representative spaces have a fair-faced finish enlivened with masonry arches and vaults, though the building's frame is concrete. Damaged during the 1940 bombardment, it was restored and in 1982 appropriated by the Academy of Visual Arts.